No Wasted Time: Let us do the work for you. We can quickly find reputable holiday decorating companies in your area. No Uninformed Decisions: You will receive access to christmas light hanging service reviews. The majority of homeowners or businesses will spend between $200 and $600 to have their holiday lights hung by a professional. The nationwide average reported cost is around $400. The minimum cost paid is around $100 while the maximum reported cost is about $1,100. What Does a Professional Lighting Service Do? Should I Rent the Christmas Lights or Buy Them Outright? How Much Are Permanent Holiday Lights? When should I schedule my Christmas light installation? How Much Does it Cost to Remove My Christmas Lights? Get Christmas Light Installation Bids Today! Outdoor Christmas lights are festive and fun: They help set the mood for the season. What’s not fun is spending many hours on a ladder hanging the lights on your roof and wrapping them around trees - particularly if you live in a cold climate. These days, more homeowners are outsourcing the task. The professional holiday lighting industry - practically unheard a decade or two ago - has exploded in popularity. People have enough stress during the holiday season, so they’re warming up to the idea of having someone else handle the difficult task. Most lighting services are landscaping companies that are trying to fill the winter lull with other work. However, there are some seasonal companies that focus exclusively on Christmas lighting and decorating. Many lighting services are part of landscaping franchises, while others are independently owned. Most lighting services focus on exterior lighting and decorations. They work closely with you to develop a design plan, then execute it. They can hang lights, install lawn ornaments, hang wreaths and garlands - you name it. Most services provide the lights and decorations, but in some cases you can supply your own. Lighting services handle all of the maintenance when your lights are up, and when the season is done they take down the decorations and store them. Some professional lighting services focus on residential or commercial work, while other services do both. The cost of professional lighting and decorating depends primarily on what you choose. A very simple display might cost $500, while an elaborate display could cost upwards of $10,000. The size of your home, the pitch of the roof and your geographic location also play a role in the price. 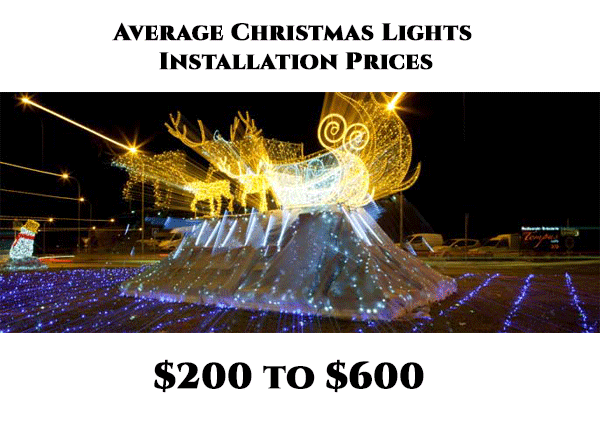 While charging per hour for holiday light installation is uncommon, some companies will offer an hourly rate. The average cost per hour ranges between $60 and $100 per employee. A standard holiday display should be completed in no more than a half day or around 4 hours on average. To run lights over your roof and along your windows and doors a company may charge between $2 - $5 per square foot. If you are providing your own lights, it will be on the lower end of that number. If you are hanging high-end company supplied lights then you will pay the higher end. If you have a very high home or eaves that are difficult to reach, expect to pay at least 20% more for your project. Your installer may have to bring in extra equipment to accommodate your home such as extra high ladders. They may even have to rent an aerial lift to reach those high locations. If exension cords can't do the job, you may need to have some ground wires or outdoor outlets installed by an electrician. Electrican's rates range from $75 to $150 per hour. Depending on the age of your home, an outdoor outlet installation can range from $350 to over $1,000 for an older home. Some holiday lights can use battery power so be sure to ask your pro about that option. Some holiday decorating pros will offer the option of renting their christmas lights instead of buying the lights outright. This option is cheaper if you only hire an installer for one or two years. Beyond that it gets much more expensive to rent as you will have to pay for the lights each year. How Much Are Permanent Exterior Holiday Lights? Permanent lighting is becoming more popular as these displays do not need to be removed after a holiday season since they are virually invisible during the day. The average cost to install permanent lighting is around $3,500. After 5 to 7 years you will need to have repairs done on these LED lights. Installers book up quickly, so book your project early! Many companies will start installations as early as September. You can never book too soon. Might as well enjoy those holiday lights as long as possible! How Much Does it Cost to Remove My Exterior Christmas Lights? Many companies include lighting removal in their holiday decoration installation packages. This is something that you should be sure is clear before you agree to a package. If the removal fee is not included, it can cost up to half the cost of your installation. Some people think outsourcing the task is worth the money; others do not. The decision is completely personal. Generally, if you dread Christmas decorating, you have a busy schedule and your budget allows for it, outsourcing is great. Hiring a professional is also the safer option as fall-related injuries associated with holiday decorating are common. If you love decorating, you have the time, and/or you’re on a tight budget, DIY is the better choice. Seek quotes from multiple services to compare prices. You never want to hire anyone without knowing whether the price you’re quoted is fair. Find out exactly what is included in the quote. Will the company provide the lighting and decorations? Will the company take care of any maintenance issues that pop up? Is removal included or does it cost extra? Ask to see photos of previous jobs. Do you like how the lighting and decorations look? Are they too sparse or too gaudy? If you don’t like the company’s previous work, chances are you won’t be happy with your decorations. Make sure the company you hire is willing to listen to your ideas. You want a company that decorates the house according to your style, not theirs. A company that tries to push its own ideas is probably not a good fit. Look for a company that does regular “drive-bys” to make sure that all of your lights are working properly and decorations are all in place. Regular maintenance is an important part of the service. Answer a few short questions & get free cost estimates for your project from trusted companies in your area.